Posted in blog business, Guest Post, Indie Polish, pictures, reviews	by Jessica W.
Good morning all! Over the next few Mondays, I’m going to have guest posts from some helpful bloggers. I hope you enjoy reading these fantastic posts. Today you get to hear from my friend Jenne at Polished Pathology! Today I have a great new product to share with you from Top Shelf Lacquer, the Top Shelf Lacquer Shower Bombs! The new year brought in a bout of pneumonia that I’ve been slowly recovering from, and when I saw her come out with these I snapped up two packs. They are so great — and I’ll give you my review after the photos! Create a luxurious and all-natural spa experience right in your own shower—no hot tub required. Simply place one of these luxurious bombs on the floor of a warm shower. 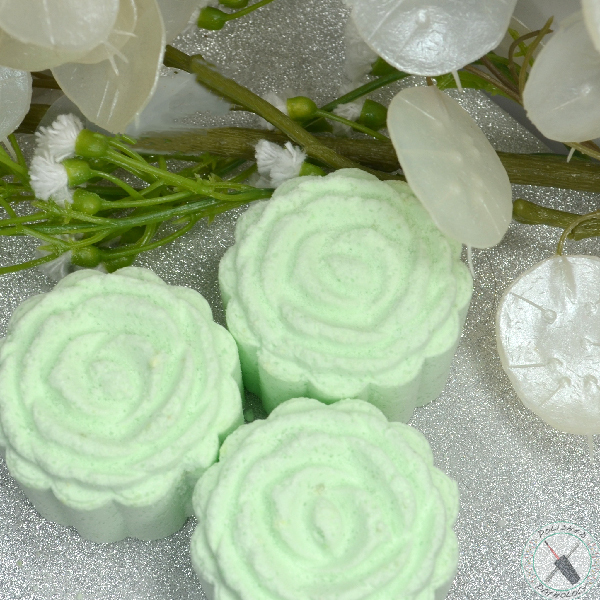 They are just what you need to get ready for the day – or to relax before bed. 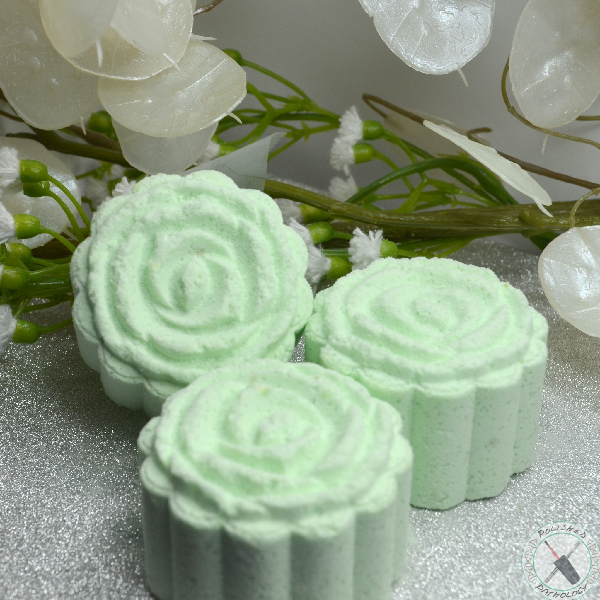 Made with Menthol and a blend of sinus clearing fragrances, you will experience the relaxing and revitalizing aromas as soon as the water starts to release them from the bomb. Each bomb weighs approximately 1.5 to 2.0 ounces. 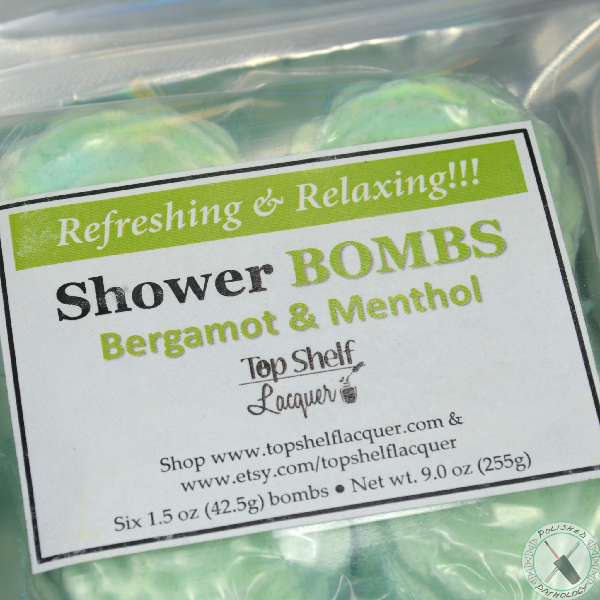 You will receive individually wrapped bombs to use for your showers whenever you want to relax or refresh! Instructions For Use: Place on the floor of the shower, away from the drain. Splash with water and the bomb will start to fizz and release aroma. DO NOT USE IN THE BATH, may irritate sensitive areas!! Caution as the shower floor may become slippery. 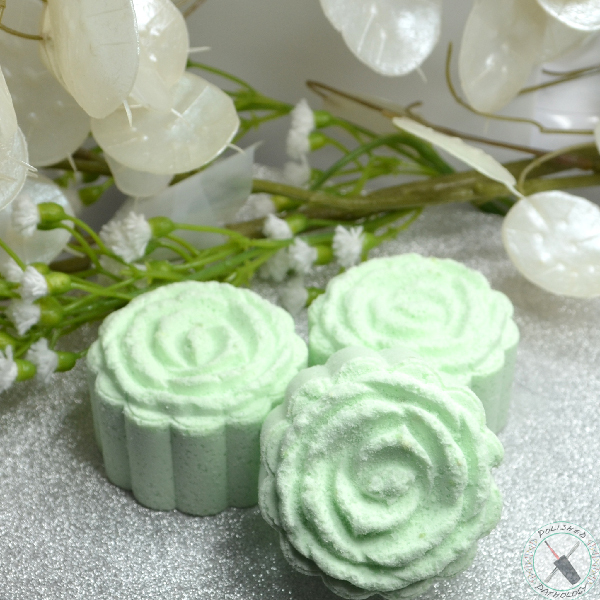 Baking Soda, Citric Acid, Cornstarch, Kaolin Clay, Menthol, Isopropyl Alcohol, Fragrance Oil. If shower bomb is colored, may contain: Glycerine, Blue #1, Yellow #10, Yellow #5, Red #30, Red 40, Red 27, Orange #5. I love that they are individually wrapped in a resealable package. I found that they are pretty solidly made, and didn’t crumble when I unwrapped it. I’ve used shower bombs before, so what I do is I put it behind me instead of directly near the drain, as they tend to last longer that way. Right as I stepped into the shower I felt the soothing calm of the menthol plus a tiny hint of bergamot. I didn’t really smell the lime, but the overall the feeling of cool relief was incredible. My sinuses opened and felt opened for a few hours after I got out of the shower. The bomb itself lasted about 5 minutes, but the menthol stayed with me my entire shower. Even when I shut the water off I still felt (and smelled) the menthol working. Thank you Jenne for this guest post! 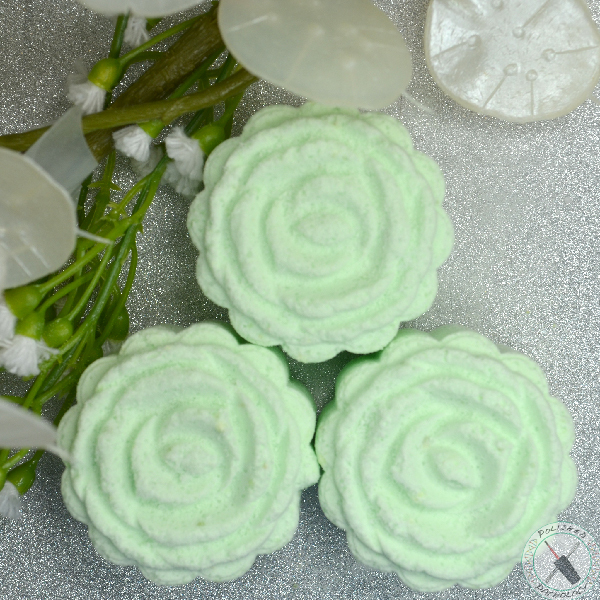 I’m certainly intrigued by these shower bombs, as I could never really get into bath bombs. Please go give Polished Pathology a follow on her Facebook page, twitter, and instagram. These look too cute to use.